We recently returned from our trip to the West Coast. We had a 9 day adventure planned out, leaving Boston on Thursday Feb 6th for LAX and returning just after Valentine's day Saturday Feb 15Th! Our trip started out in West Hollywood where we spent a few days with some great friends. We came to California with a mission, we had a list of things we wanted to do. I am going to break this into parts and days otherwise I will be here all night and this post will become very very long! Flying out of Boston first thing in the morning was tough..... it was freezing and there was a ton of snow everywhere! Our flight was really long too... 6.5 hours direct! WTH?! They pretty much took us all the way up to Canada and did a tour of the Midwestern states. I thought for sure it was only 5.5 hours last time but who knows. I was glad we had decided to take JetBlue, I got my HGTV fix the whole flight, but needless to say we were so happy to be off that plane and to actually be able catch up with Luigi over some lunch and tasty beer. 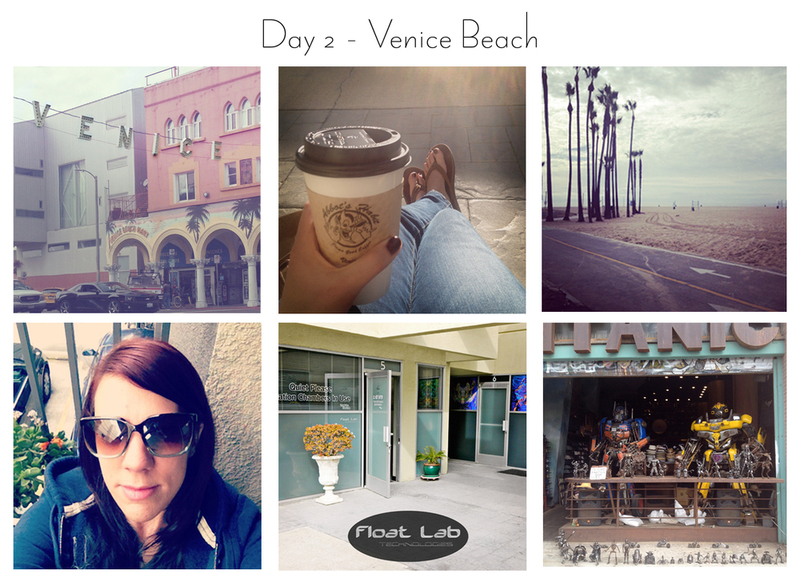 Venice Beach is always an experience, there are so many different people and things to see. The shops vary from your everyday items to interesting sculptures and art pieces, galleries and also some sketchy places you might not want to go into. Luigi and I decided after walking the boardwalk for a bit we had enough of it and off to Abbot Kinney Blvd we went. We stopped and had lunch at this cafe called 3 Square Cafe and Bakery. You really don't find fish tacos on the menu out here on the east coast, but there it was staring me in the face... saying Wendy try the fish tacos.... I have to say it was the first time I had ever tried them and they were delicious! love it! So much so that I had them again when we were in SD, but that's for a later post. After entertaining ourselves window shopping and people watching, it was nice to sit in the warm sunny courtyard with a mocha latte waiting for Tim's session to be over, which by the way he said the experience was awesome and he would definitely go back again. Who knows maybe I will give it a try. After all that walking around you can say we got a little hungry. So the four of us headed over to Tortilla Republic for dinner. Can I say YUM! The food was amazing and so were the drinks! Bellinis and Mojitos! So that's it for now, stay tuned for round 2!